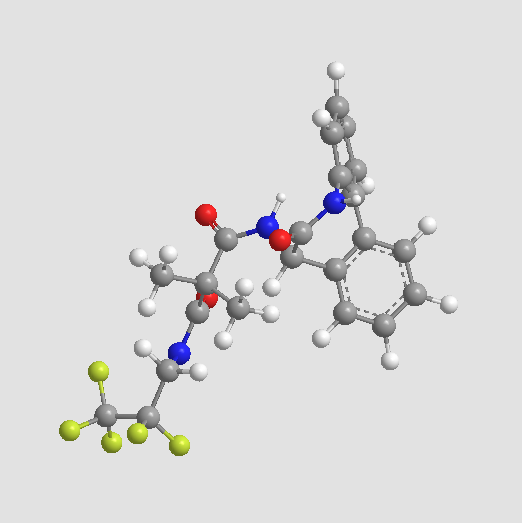 RO4929097 inhibits cell proliferation. The indicated cell lines were treated with DMSO (white circles) or 10 μM RO4929097 (black circles). A representative curve of three independent experiments is reported. ***p<0.001. Debeb B G, Cohen E N, Boley K, et al. 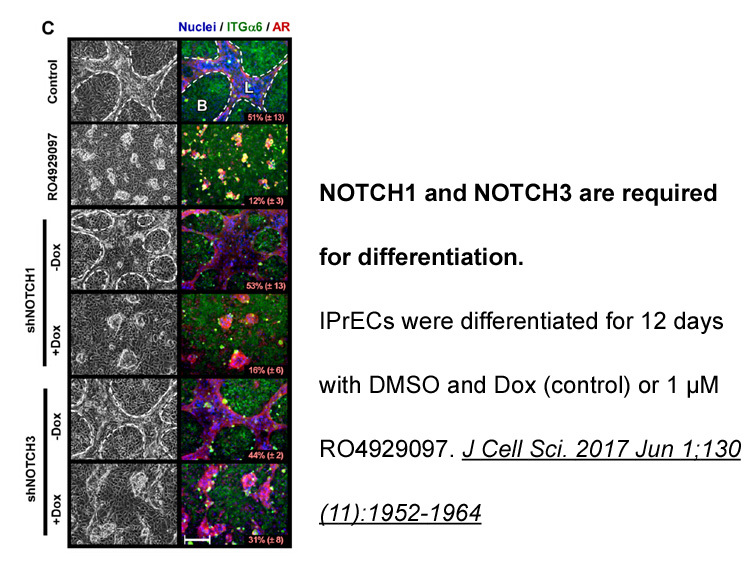 Pre-clinical studies of Notch signaling inhibitor RO4929097 in inflammatory breast cancer cells. Breast cancer research and treatment, 2012, 134(2): 495-510. Huynh C, Poliseno L, Segura M F, et al. The novel gamma secretase inhibitor RO4929097 reduces the tumor initiating potential of melanoma. PloS one, 2011, 6(9): e25264. 1. A phase I study of the combination of ro4929097 and cediranib in patients with advanced solid tumours (PJC-004/NCI 8503). Br J Cancer. 2013 Aug 20;109(4):943-9. doi: 10.1038/bjc.2013.380. Epub 2013 Jul 18. The development of the combination therapy of RO4949097 and cediranib is based on the understanding of the Notch signaling’s role in tumorigenesis and drug resistance. 2. A phase Ib combination study of RO4929097, a gamma-secretase inhibitor, and temsirolimus in patients with advanced solid tumors. Invest New Drugs. 2013 Oct;31(5):1182-91. doi: 10.1007/s10637-013-0001-5. Epub 2013 Jul 17. The recommended dose, safety, PKs and pharmacodynamics of RO4929097 plus temsirolimus are to be explored. 3. Implications of plasma protein binding for pharmacokinetics and pharmacodynamics of the γ-secretase inhibitor RO4929097. Clin Cancer Res. 2012 Apr 1;18(7):2066-79. doi: 10.1158/1078-0432.CCR-11-2684. Epub 2012 Feb 20. The RO4929097 binding in plasma and its potential impact on the pharmacokinetics and pharmacodynamics of RO4929097 were investigated. 4. 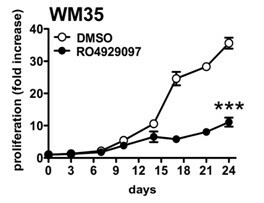 PTEN regulates sensitivity of melanoma cells to RO4929097, the γ-secretase inhibitor. Anticancer Res. 2013 Apr;33(4):1307-16. The anti-melanoma activity of RO4929097, a GSI catalyzing the cleavage of the Notch receptor, is associated with PTEN expression, where RO4929097 alone or in combination with chemotherapy induces apoptosis through reducing AKT phosphorylation in melanoma cells expressing PTEN. 5. A phase II study of RO4929097 in metastatic colorectal cancer. Eur J Cancer. 2012 May;48(7):997-1003. doi: 10.1016/j.ejca.2012.02.056. Epub 2012 Mar 23. RO4929097, a γ-secretase inhibitor was assessed for its activity in patients with metastatic, refractory colorectal cancer. 1. Luistro L, He W, Smith M et al. Preclinical profile of a potent gamma-secretase inhibitor targeting notch signaling with in vivo efficacy and pharmacodynamic properties. Cancer Res 2009; 69: 7672-7680. 2. Huynh C, Poliseno L, Segura MF et al. The novel gamma secretase inhibitor RO4929097 reduces the tumor initiating potential of melanoma. PLoS One 2011; 6: e25264. 3. Richter S, Bedard PL, Chen EX et al. A phase I study of the oral gamma secretase inhibitor R04929097 in combination with gemcitabine in patients with advanced solid tumors (PHL-078/CTEP 8575). Invest New Drugs 2014; 32: 243-249. 4. Sahebjam S, Bedard PL, Castonguay V et al. A phase I study of the combination of ro4929097 and cediranib in patients with advanced solid tumours (PJC-004/NCI 8503). Br J Cancer 2013; 109: 943-949. 5. Diaz-Padilla I, Hirte H, Oza AM et al. A phase Ib combination study of RO4929097, a gamma-secretase inhibitor, and temsirolimus in patients with advanced solid tumors. 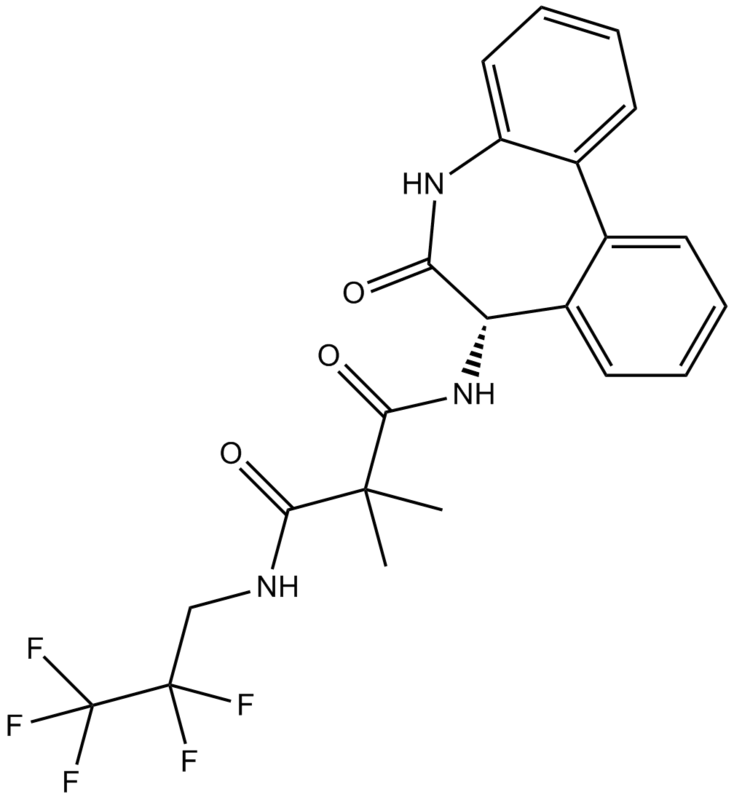 Invest New Drugs 2013; 31: 1182-1191. 6. Tolcher AW, Messersmith WA, Mikulski SM et al. Phase I study of RO4929097, a gamma secretase inhibitor of Notch signaling, in patients with refractory metastatic or locally advanced solid tumors. J Clin Oncol 2012; 30: 2348-2353. 7. Strosberg JR, Yeatman T, Weber J et al. A phase II study of RO4929097 in metastatic colorectal cancer. Eur J Cancer 2012; 48: 997-1003. 8. Kolb EA, Gorlick R, Keir ST et al. Initial testing (stage 1) by the pediatric preclinical testing program of RO4929097, a gamma-secretase inhibitor targeting notch signaling. Pediatr Blood Cancer 2012; 58: 815-818.